On occasion I take a swipe at the USDA’s Fresh Produce Inspection Branch. This is one of those times. A produce receiver recently encountered a load of cantaloups that came in with high temps and showed some obvious black surface mold. Realizing the seriousness of this defect the USDA was called in to perform the inspection and did not find the black mold serious enough to be scored as a defect. I took a look at the USDA’s Grade Standard and their own inspection instructions for cantaloups. I found no specific scoring guideline for surface mold in the US Grade Standards (when materially affecting the appearance), meaning the scoring definition is subjective, up to the USDA’s interpretation. Sort of like an executive order, where the industry has no input or opportunity to comment on the scoring guideline. The light type of surface mold, which disappears after exposure to the outside air, would rarely affect the marketing quality of the cantaloups. 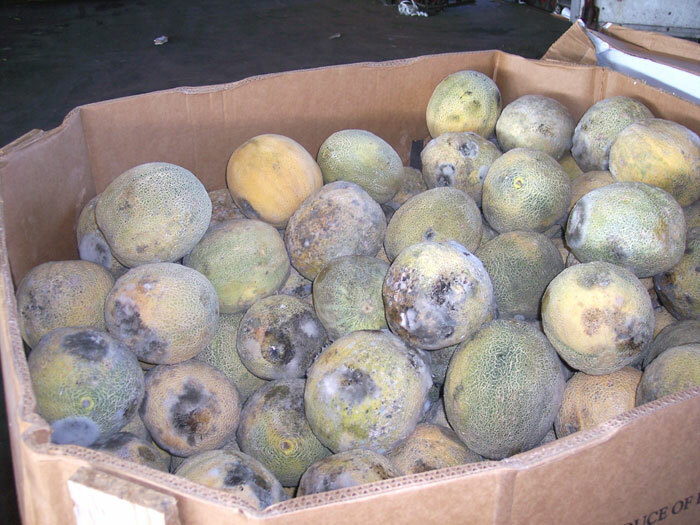 Black surface mold affecting sunken areas frequently develops into decay that seriously affects the marketability of the cantaloups. It is difficult to judge how seriously the mold may affect the marketing quality. However, it should be scored more strictly on weak melons past their prime than on fresh, bright stock. Frequently, mold growth is seen only in stem scars; these scars being moist. 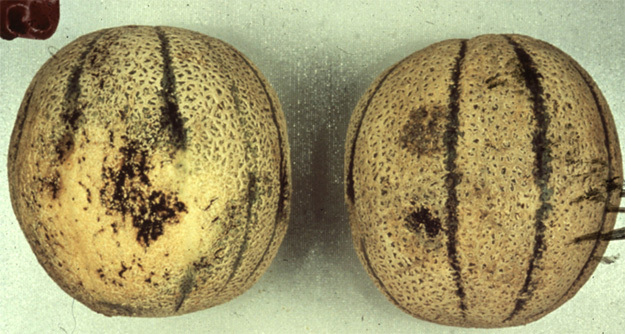 Care should be taken not to score such melons as decay unless actual breakdown of tissue is present and sloughs out under finger pressure. The presence of such mold in stem scars without resulting decay should not be reported as a defect. Now you may be asking yourself if shippers would knowingly ship product with surface mold. The US Standard does have a specific scoring guideline for surface mold at shipping point. Zero, none. Any amount of surface mold, regardless of color (white, gray, black, etc.) is scored as a free from defect, and scored against the 1/2 of 1% decay tolerance for surface mold and decay. Why the USDA would have a strict scoring guideline in place at time of shipment and a completely ridiculous scoring guideline in place at destination points is beyond me…..and yes, they can change this scoring guideline any time they would like, without going through the Federal Register process. In the meantime, be very cautious if you find black mold on your cantaloups, as this mold could quickly turn into decay. Hopefully if you need a USDA inspector he/she will show some signs of common sense and score the cantaloups as being defects. If you have no luck with the USDA then I am sure most shippers will understand the seriousness of this defect, and with a few digital images of your own, they will give you credit on the load. Maybe you can send the USDA some of your images too and they can update this hideous visual aid they currently are using. Score when mould exceeds 5% of the surface area.